Eric McIntosh (Bruntsfield Links), the 2016 Scottish U18 boys champion, showed the capacity field a clean pair of heels with a course record-equalling score in the first stroke-play qualifying round of the Scottish men's amateur championship at Blairgowrie Golf Club. US college student McIntosh, pictured left, shot a 64 over the par-72 Rosemount Course, finishing the day three clear of Andrew Thornton (Lundin) and Andrew Davidson (Charleton) who also played their first rounds over the Rosemount Course. Davidson had a hole in one with a 52 degree wedge at the short 15th, the "Wee Dunt." The Lansdowne course, which is also being used, has the same par of 72 but has an SSS of 73 and the CSS for this course today was 74, compared with 72 for the so called "easier" Rosemount lay-out. The leaders over the Lansdowne course shot 69, including one of the North's leading hopes, Kyle Godsman (Moray). The players switch courses for their second Q round and then at the end of the 36 holes, the 64 players with the lowest aggregates will go into the match-play stages. 64 Eric McIntosh (Bruntsfield Links). 67 A Thornton (Lundin), A Davidson (Charleton). 68 M Hislop (Glenbervie), R Morrison (Australia), S Easton (Irvine). 69 S Blair (Royal Musselburgh), J Wright (Forres), M Rolland (Bruntsfield Links), S Marc (Broomieknowe), R J Smith (Dalmahoy Hotel), G Greer (Carluke), C McKinney (Australia), M Brodie (Alyth), K Godsman (Moray). 70 A Thomson (Lanark), Euan McIntosh (Turnhouse), S Buchanan (Prestwick St Nicholas), M Lawrie (Deeside), C Wilson (Castle Park), F Hughes (Newton Stewart), K Gunnyeon (Murcar Links), A Fisher (Peterculter), R Gordon (Alford). 71 C Bruce (Duff House Royal), J Arandia (Stonehaven), J Bryce (Bathgate), J Paterson (St Andrews New), M Clark (Kilmacolm), S Scott (Nairn), G Wishart (Lundin), I Taggart (Lenzie), C D Scott (Nairn), L Murray (Troon Welbeck), S Roger (Peebles), J Johnston (Ayr Belleisle), M S Smyth (Royal Troon). 72 G Cross (Cawder), W Porter (Carnoustie), N Saldarov (Craigielaw), C McGuigan (Comrie), S McLaren (Bruntsfield Links), M Cowie (Dumfries and Co), J Wilson (Balmore), C Fyfe (Cawder), J Roberts (Muckhart), D Rudd (Longniddry), S Macpherson (Bothwell Castle), G Graham (Blairgowrie) A J Rae (St Andrews New), S Thurlow (Murrayfield), G Campbell (Blairbowrie). 73 A O'Hagan (Old Ranfurly), R Franssen (Inverness), J Shaw (Boat of Garten), C Lamb (Newmachar). 74 C Franssen (Inverness), M Halliday (Royal Aberdeen), L Bryce-Maynard (Moray). 75 J Keith (Inverness), N Young (Insch), M Thomson (Kintore), F Milne (Banchory). 76 S A Pears (Nairn), D Smith (Portlethen), T Ogston (Nigg Bay), D Fanthorpe (Kemnay). 77 R Sharpe (Murcar Links), F Asher (Nairn), L Smart (Banchory), M D Clark (Inverness). 78 H Charles (Deeside), E Gill (Fortrose and Rosemarkie), B Henderson (Deeside). 79 R O'Donnell (Oldmeldrum), C Carnegie (Kemnay), D Bradburn (Aboyne), C Cheyne (Newmachar). 80 C Leith (Royal Aberdeen), C Morrison (Inverness), L Wardron (Royal Aberdeen), L Reid (Fortrose and Rosemarkie), P Lemon (Cruden Bay). 82 C Coutts (Kintore), R Stewart (Inverurie), C Forbes (Deeside), L Fraser (Inverness), A C Burgess (Nairn), K Willox (Deeside). 86 D Sim (Royal Aberdeen). NR G Joss (Royal Aberdeen). Bruntsfield’s Eric McIntosh, 19, leads the field after today’s opening round of the Scottish Men’s Amateur Championship at Blairgowrie. 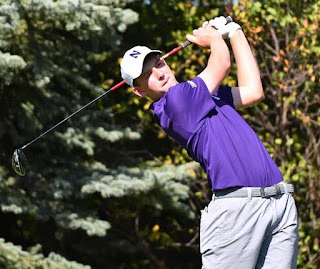 The 2016 Scottish boys' champion, who is currently in the US attending Northwestern College, carded an 8-under par course record-equalling 64 on the Rosemount Course and is three shots clear of Andrew Thornton (Lundin Golf Club) and Charleton’s Andrew Davidson on 5-under. It was all smiles for Davidson towards the end of his round as he aced the 15th hole, Wee Dunt, with a perfectly executed 52-degree wedge. The now joint Rosemount Course record holder, host club member Glenn Campbell, is also in the field this week and returned a solid level par 72 to sit in a share of 37th place. Campbell won the Scottish Men’s Amateur Championship 13 years ago at Southerness. On a day where the scoring was lower on the Rosemount Course, Stuart Blair (Royal Musselburgh), Sean Marc (Broomieknowe) Kyle Godsman (Moray) and Michael Brodie (Alyth) returned the joint lowest scores of the day on the Lansdowne course with 3-under par 69’s. The field of 264 golfers will resume tomorrow for the second round of stroke-play qualifying, with the top 64 players progressing to the match-play stages.